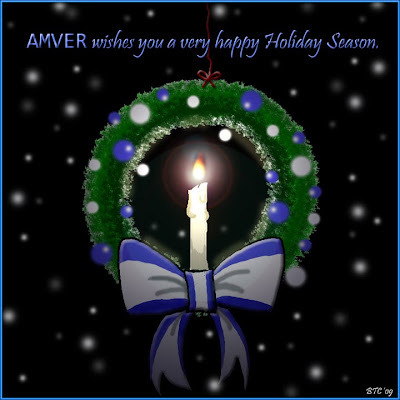 The entire Amver team wishes you a prosperous and happy New Year! We hope 2010 brings the return of better shipping, safer seas, and an increase in the number of vessels enrolling in Amver. As 2009 comes to a close we welcome some of the last enrollees in the Amver system. From everyone at Amver to our extended maritime family we wish you a safe and prosperous new year. Here are the latest members of our search and rescue system. We look forward to even more ships joining the Amver ranks in 2010! Thank you for enrolling your vessels. We hope to see your ship's name here in the coming year. Captain C. Thanga Swamy, master of the APJ Suryavir, reported to Amver his crew had made repairs to the ship's engines and were no longer in distress. "Please cancel below distress message sent earlier, vessel no longer in distress, normal working resumed..." said the Captain. The APJ Suryavir reported there were adrift approximately 540 miles south of Adak, Alaska when the weather became very rough and they stated they may have to abandon ship. While the Coast Guard launched a C-130 aircraft, the Amver participating container ship Maersk Altair was also diverted to assist if necessary. The crew of the APJ Suryavir remains in contact with Coast Guard search and rescue authorities. Our colleagues at Coast Guard Headquarters recently sent out a feature release highlighting the Coast Guard's gift ideas for the 12 nautical days of Christmas. In case you missed that release here are the suggestions for the mariner you may be shopping for. What's on Amver's holiday list? Yesterday the 738 foot bulker APJ Suryavir reported to United States Coast Guard rescue authorities they had lost all power and were adrift in rough weather approximately 540 miles southwest of Adak, Alaska. Search and rescue personnel immediately launched a Coast Guard C-130 aircraft and diverted the Amver ship Maersk Altair. While the master and crew of the APJ Suryavir prepared to abandon ship it appears, according to communications from the ship, that the engines have been restarted and the vessel is under its own power. The U.S. Embassy in Seoul and the Korean Shipowner's Association hosted an Amver awards ceremony in Seoul, Korea on Monday December 14, 2009. There were 51 Korean ships earning awards, representing 15 companies. Mr. Mark Tokola, Deputy Chief of Mission, United States Embassy Seoul, gave the keynote address to the award recipients and other attendees. United States Coast Guard International Port Security liaison to South Korea, Lieutenant Commander Patricia Springer, represented the Coast Guard. Award recipients included the Dong Jin Shipping Company, EUKOR Car Carriers, Haeyoung Maritime Services Company, Hanjin Ship Management Company, Hanjin Shipping Company, Hyundai Merchant Marine Company, Korea Line Corporation, Laurus Ship Management Company, SH Marine, ShippingBank Company, SK Shipping Company, STX Pan Ocean Company, Vesta Shipping Company, and Wilhelmsen Ship Management (Korea). Congratulations to the Award winners! Amver also thanks the Korean Shipowner's Association for their dedication to ensuring no call for help goes unanswered and we look forward to having an even greater number of Korean vessels enroll in Amver and earn awards. Three French sailors will be home for the holidays after being rescued from their capsized sailboat 600 miles east northeast of Bermuda early Sunday morning December 13, 2009. Fortunately the yachtsmen were well prepared with survival equipment and a 406 MHz Emergency Position Indicating Radio Beacon, or EPIRB. The French trio first encountered trouble when their 40 foot sailboat, F Et Mer, capsized the evening of December 12th. According to survivor reports, they sent a distress signal but were unable to deploy the lifeboat due to damage sustained in the capsize. 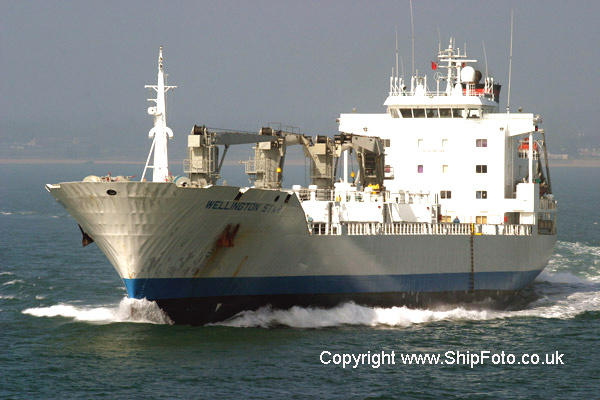 Rescue officials, having received the distress beacon's signal, requested the Bahamian flagged cargo ship Wellington Star to divert and steam towards the last known position of the F Et Mer. Captain Eduard Rogov, master of the Amver participating cargo ship, was only 92 miles from the location of the French sailors when he set a course to rescue them. Once Captain Rogov was on the scene he quickly saw the yacht had also suffered a broken mast, damaged rudder, and hull damage. "They were taking on water at about five gallons an hour," said Captain Rogov. "The weather and night conditions complicated the rescue. I estimated the winds to be Force 9 on the Beaufort Scale [47-54 mph] with waves in excess of 26 feet," he added. Despite the challenging conditions, Captain Rogov's crew was able to rescue all three Frenchmen. The crew of the Wellington Star quickly evaluated their condition and gave them dry clothes and food. The Wellington Star is managed by Dobson Fleet Management Ltd of Cyprus. "The Coast Guard provides the technology to coordinate the Amver alerts, but it is the commitment of our partners in the commercial shipping community that makes this program successful," said Rear Admiral Wayne Justice, Commander of the United States Coast Guard's Fifth District and the command center responsible for coordinating the rescue. The fate of the sailboat was not as fortunate. The F Et Mer was left adrift and marked as a hazard to navigation. The survivors were taken to the Wellington Star's next port call, New Bedford, MA where there were met by U.S. officials to help them return home. It's nice to see ships continue to enroll in the Amver system during the holiday season. It gives us a sense of giving back and thankfulness. We are thankful that you feel it is important to make yourselves available to assist mariners in distress, even if that means missing a port call. We know your participation could cost you money. That's the gift you give us and the maritime community. What impact does Amver have on safety at sea? All you have to do is read about rescues like this or this to know Amver has a significant positive impact on safety at sea. Because this is the season of celebration why don't we celebrate the latest members of the Amver family. Thank you for enrolling and have a happy and safe holiday! The Amver participating container ship ACX Diamond was diverted by United States Coast Guard rescue authorities to assist a disabled fishing vessel approximately 100 miles northwest of the island of Ponape on October 4, 2009. The ACX Diamond, a Singapore flagged container ship, was on a voyage from New Zealand to Toxyo when rescue authorities in Guam contacted the ship about a distress beacon approximately 136 miles from their location. The Diamond was diverted because it participates in the Amver search and rescue system. It enrolled in July, 2009. Captain Carino, master of the Diamon, ordered the crew to sail to the distress location and prepare for rescue operations. After eight hours the Diamond arrived alongside the fishing vessel NFC Chuuk dead in the water. " We had been adrift for four days with main engine troubles and no spare parts," said Fabian Maithay, Captain of the NFC Chuuk. After coming alongside the Chuuk, Captain Carino's crew determined repairs were impossible and towed the vessel towards the FSS Independence which had been dispatched by rescue authorities to complete the rescue. All seven crewmen of the NFC Chuuk were in good health. We were honored and proud to host an Amver awards ceremony on December 2, 2009 at the Marintec Shipping Exhibition in Shanghai, China to recognize 15 Chinese ships participating in the Amver search and rescue system. at least 128 days in 2008. Captain Li Bing (left) receives the blue Amver pennant from Benjamin Strong, Amver director, and United States Coast Guard liaison to China, Captain George Vance. total of 51 years of participation in the only global voluntary search and rescue system. We hope more Chinese ships enroll in Amver and we look forward to attending Marintec 2011 to host another awards ceremony! As promised we have an update on the Amver rescue of three French sailors 600 miles east northeast of Bermuda. Below is video from the United States Coast Guard C-130 aircraft. The video shows the difficult nature of these rescues and the bravery of both the crew of the rescue ship, Wellington Star, and the survivors. The survivors should arrive in New Bedford, Mass in the coming days. Amver has learned of a recent rescue of 3 French sailors 600 miles east northeast of Bermuda. The United States Coast Guard Fifth District Public Affairs office reported the rescue early Sunday morning December 13, 2009. The Amver participating M/V Wellington Star answered the call for assistance. With assistance from a United States Coast Guard C-130 aircraft from Air Station Elizabeth City, rescued the sailors and is enroute with them to their next port of call in New Bedford, Mass. We will keep you updated on the rescue operation and provide photos as soon as we receive them. Amver had the pleasure of exhibiting and hosting an awards ceremony at the Marintec All China Maritime Exhibition in Shanghai, China this month. Below is a video recap of the events. A Florida yachtsman and his Peruvian partner are happy to be back on dry land after being rescued from their sunken sailboat on Saturday December 5, 2009 by a Polish cargo ship. The sailors, on a journey from Mexico to Costa Rica, abandoned their sailboat approximately 150 miles west of Costa Rica and activated their emergency beacon. Costa Rican and United States Coast Guard rescue authorities began an intensive search effort including diverting several Amver ships. The cargo ship Kociewie, managed by the Polish shipping company Polska Zegluga Morska, located the survivors about 5 miles away from the sinking sailboat. The Kociewie, an Amver participant, was sailing from Korea to Balboa, Panama when they were requested to divert. The tankers Singapore Star and Chembulk Minneapolis, along with the cargo ship Hanjin Atlanta, were also diverted to assist. According to rescue authorities the winds at the scene were over 20 knots and waves were between 8 and 10 feet when the master of the 38,000 dwt Kociewie hoisted the two sailors from their raft. "The survivors were uninjured and safe," reported the crew of the Bahamian flagged cargo ship as they steamed toward Panama. The survivors were met by Panamanian authorities when they arrived in Balboa on December 7, 2009 and the Kociewie continued on to Barcelona, Spain. The Kociewie enrolled in the Amver program on November 10, 2009. This is the first time it has been requested by the United States Coast Guard to perform search and rescue operations. 37; that's the number of new vessels enrolled in the Amver system in the past week. These 37 ships are adding to the increasing number of vessels on the daily plot. 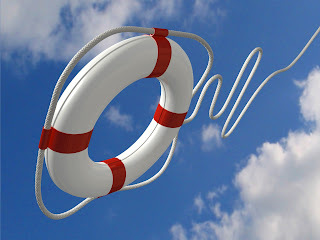 Don't think enrolling doesn't mean your vessel won't be called upon to help. 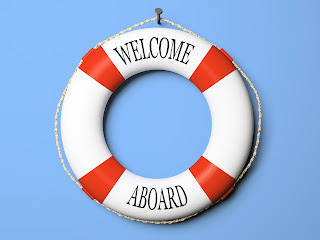 In one case an Amver ship was called upon to rescue a yachtsman 5 days after enrolling! In the meantime please help us welcome the latest additions to the Amver family. Thank you for enrolling and we look forward to receiving your Amver messages! Our good friend Barbara Patton has outdone herself over at CG Scuttlebutt. 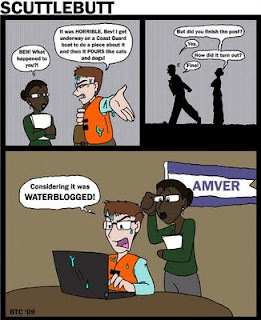 One of her latest cartoons features the Amver team. Barbara doesn't mince words and has a fun time with Amver's social media endeavors. We hope you laugh as hard as we did. Thanks Barbara! Greetings from Shanghai, China and the Marintec maritime exhibition. Despite some challenges in blogging we have found a work around and are pleased to be able to send our weekly feature via SMS/text messaging! 31 ships have enrolled in the Amver system in the last week on the heels of another Amver ship being seized by Somali pirates. We are glad these vessels are part of the Amver family. Can you believe it! Amver has reached another record. On Saturday November 28 there were 3,758 ships on plot for a 24 hour period. That is the greatest number of Amver ships available to assist those in distress in our 51 year history and it wouldn't be possible without the support of the shipping community. Amver is blogging from Marintec maritime exhibition in Shanghai, China. we are facing some challenges sharing our story on the blog but have a rough solution that should allow us to get our word out to you. Our situation is far less perilous than the crew of the Greek flagged tanker Maran Centauras. The Amver participating ship was seized by Somali pirates earlier this week. Keep the crew in your thoughts and prayers. we will do our best to keep you updated on this incident.